Eating food high in antioxidants is highly recommended for a healthy diet. Pure maple syrup features 67 different antioxidants, positioning it among fruits and vegetables well-known for their health benefits. Pure maple syrup is superior to white sugar when it comes to increasing your antioxidant intake. Why? Maple syrup is unprocessed and thus retains all the antioxidant molecules that the tree produces to protects itself in its wild environment. Maple syrup contains 67 types of antioxidants, similar to fruits and vegetables. Maple syrup retains its antioxidant molecules , since it comes almost directly from the tree. Pure maple syrup contains many active antioxidant elements, such as polyphenols, trace elements and vitamins. Recent studies have shown that maple syrup contains several families of antioxidants, similar to those in berries, tea, whole wheat, flax seed and red wine. The number and variety of antioxidants in maple syrup bring it on power with red Gala apples, broccolies and bananas. 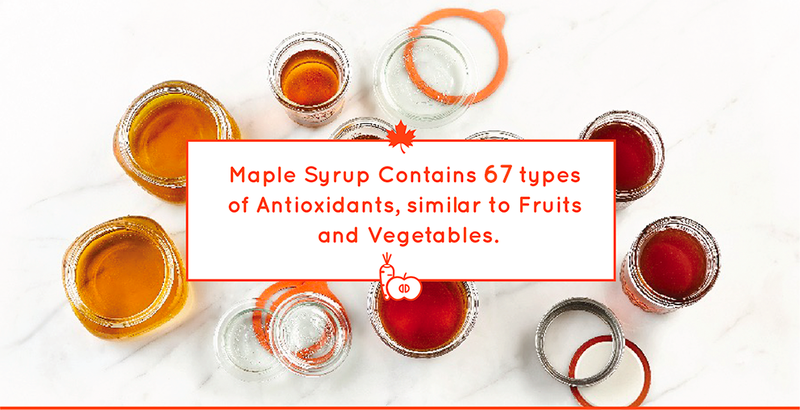 83 gms of pure maple syrup contains as many antioxidants as an apple, and provides between 10% to 38% of the recommended daily antioxidant allowance. 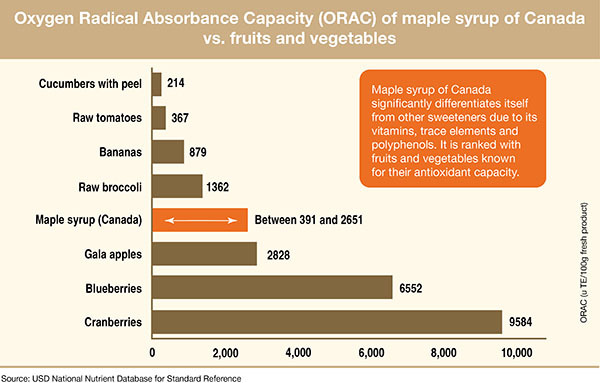 The darker the grade of maple syrup, the higher the antioxidant activity.